More than 350 people gathered for the network of foreign South Tyrolians’ 11th annual „Simply Südstern“ event at the Tramin wine cellars. 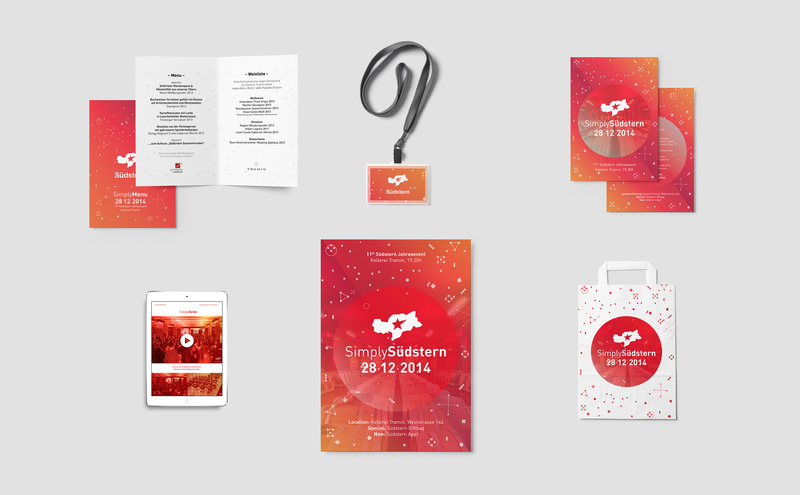 Südstern commissioned us to design an atmospheric evening and manage the event in a very local setting, where speck, cheese and wine were served and the Südstern iphone app was presented. We used the winery's signature red for all printed matter and vinyl infographics on the walls served to exhibit various information about Südstern's members from all around the world. Booking local dancers for the typical Schuhplattler seemed naturally in an event series where tradition meets innovation, and locals meet homecomers. Among the guests were found representatives from Südstern’s partners EOS, TIS, BLS, SEL AG as well as Laimburg and Südtiroler Sparkasse AG.